A passion for the off-road is a powerful thing, one that compels you to go fast, get dirty, and embrace the great outdoors in all its glory. However, it shouldn’t take even one close call to make you realize that proper riding apparel is key to a safe off-roading experience. Whether this is your first time shopping for riding apparel or your wardrobe needs an update, we are here to help. In this guide, we explain how to select ATV apparel and accessories so you can make a smart investment for all those future endeavors on your trusty all-terrain vehicle. A heavy-duty ATV can take a beating, but the human body cannot. 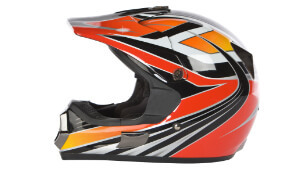 Don’t get caught out on the track or the trail without adequate protection from potential accidents and the elements. Boots: One of the biggest mistakes that new riders make is assuming that an old pair of sneakers will suffice for riding. However, you will use your feet and legs a lot to control the weight distribution of your all-terrain vehicle when taking turns or taking on jumps. A quality pair of boots is key to getting adequate ankle and foot support. Your riding boots must also ride up high enough to prevent burns caused by the hot engine or exhaust from pipes and mufflers. Motocross boots tend to have less grip on the sole whereas quad-style boots tend to have more tread. Depending on your riding style, you may prefer a pair of boots that allows you to hike and tread manually through tough trail sections. Gloves: Flying gravel and other kinds of ricochet are to be expected in the off road, especially when riding at a fast pace or over rough terrain. To keep your hands safe, you should invest in a quality pair of gloves. Riding gloves will not only protect your hands from bushes and branches but also from the calluses and soreness caused by constantly rubbing and squeezing the handles of your ATV. Sporty gloves are typically lightweight, vented, and tight-fitting with padding in the palm area and soft plastic pads to protect the fingers. You might prefer a pair of gloves that have fingers constructed of multiple sections to ensure a better fit when gripping the bars. Goggles: The off-roading adventure doesn’t come without its challenges, but eye protection shouldn’t be one of them. You can probably guess how painful and dangerous it is when dust, rocks, sand, and all sorts of debris come into contact with unprotected eyes. Most riding goggles feature a flexible plastic frame to prevent them from breaking upon impact as well as a foam perimeter to block out dust and sand. You may prefer goggles that have an anti-fog coating to prevent steam from limiting your visibility. Helmet: Wearing head protection is one of the most responsible things you can do as an ATV enthusiast. The decision depends on your personal preferences. Full-face helmets come fully equipped with a built-in face shield and molding that extends over your chin and mouth for added protection. Open-face helmets may be much less constrictive but they also provide much less protection. If you plan on racing or riding rough, don’t settle for anything less than an off-roading helmet. You will also want to check for “DOT” and “Snell” logos to ensure that the helmet has passed safety standards. Jacket: Even a nice, sunny day can turn into a chilly ride without the right layers. A riding jacket should be flexible enough to let you move around and check out your surroundings but it must also provide enough coverage to keep you warm and comfortable. If you tend to take the ATV out more often when the weather’s cool, you may want a riding jacket that offers long, snug cuffs and a pull-up collar area to keep your neck warm. A fleece lining will also keep you warm when traversing snowy trails. Motocross and off-roading jackets are made of a wide variety of materials. Pants: When the weather isn’t ideal, you should always wear a long pair of pants to keep your legs safe from the elements and flying debris. Any old pair of jeans won’t necessarily do. Off-roading pants should be durable, roomy, and made of quality materials with heavy-duty stitching. Some pants feature a shell construction that resists water and wind. Others can be folded up into themselves and fashioned into a fanny pack, complete with a belt built right in. Underlayers: Layering allows you to regulate your own temperature in the off-road. Having a jersey or turtleneck underneath your jacket will make it easy to cool down when the sun rises and it starts to get warm. There are all sorts of base layers you can choose from to stay ready for any kind of conditions you might find on the trail. When the temperature starts to drop, it is important to keep yourself properly covered with riding apparel that can handle cold weather conditions. Beneath your helmet, you might try sporting a balaclava for additional warmth and protection from the wind. Boot liners provide extra warmth for your feet without changing the fit of your boots. Riding an ATV competitively means that you have to take every precaution to protect your skin from the rough terrain of the course. You should never get on your quad without wearing knee or elbow pads and knee or shin guards. You should also invest in a kidney belt, which will protect the lowest part of your back and waist without disrupting the normal breathing pattern. Wrist braces, neck braces, racing collars, and vests are also worthwhile for ATV enthusiasts. Knowing how to select ATV apparel and accessories can make all the difference in a day of riding. Make the smartest decision for your own safety by investing in quality clothing made specifically for the off-road.